AvroKO has transformed an art-deco building in London into a members-only work and leisure destination, aiming to combine the perks of a private club with those of a co-working office. 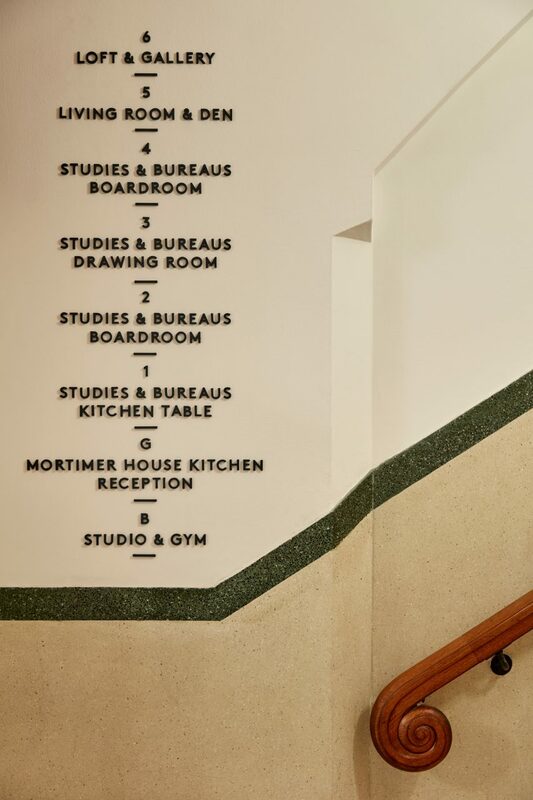 Called Mortimer House, the 2,900-square-metre members’ club is located in a seven-storey block on Mortimer Street in Fitzrovia, and includes co-working spaces, bars, and lounges. With a focus on wellbeing and fitness, the top floor hosts a yoga and pilates studio and a meditation room, while a gym is housed in the basement. The building, which had been been used as an office since the 1970s needed to be completely gutted before work began. A new elevator core was inserted and two new balconies were added to the top two floors. The architects uncovered original wooden floors in the bar and lounge spaces and an original terrazzo floor in the central stairwell where the original bannister was also restored. In the entrance lobby, an intricate mosaic has been mended and restored. “We tried to keep as much of the original building as possible,” Adam Farmerie, lead designer and partner at AvroKO, told Dezeen. 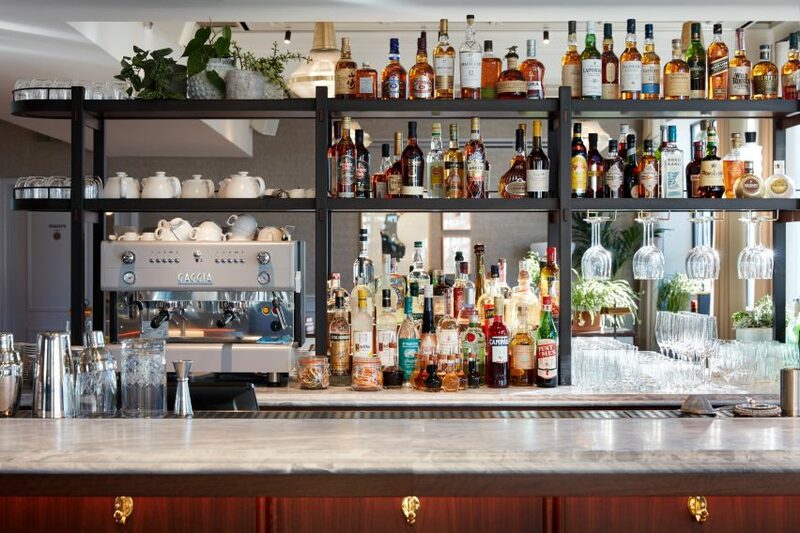 Inspired by the building’s art deco heritage, the interiors feature original wooden floors, marble counters, oak-paneled walls, exposed terracotta ceilings, brass light fittings and cane doors. Walls are painted in dusty pinks, greens and blues in keeping with the colours of the era. “We’ve also integrated a lot of design features that will reduce anxiety in the space,” said Farmerie. The concept of the club is based upon the renowned “hierarchy of needs” developed by American psychologist Abraham Maslow. It teaches that people have lower order needs that in general must be fulfilled before high order needs can be satisfied. The process of fulfilling these needs leads to self actualisation. “We looked into philosophies of human motivation and we tried to apply it as much as we could in the design and in the hospitality services and facilities,” Mortimer House founder Guy Ivesha told Dezeen. The hierarchy is applied to each of the floors: physicological needs are fulfilled in the restaurant on the ground floor where a Mediterranean restaurant with a separate entrance is open to the public. Food is served from an open chefs counter while a plant-filled conservatory with a communal table can also function as a private dining room. The co-working spaces on the first to fourth floors revolve around social belonging. Designed to evoke the area’s industrial history as a hub for textile production, Crittal-style glass partition walls have been used to divide the office spaces. There are 180 desks across collaborative and private office spaces, as well as meeting rooms and printing facilities. Phone booths outside the offices provide a place for private calls. The offices are filled with plants to help aid productivity of members, acoustic panels will dampen noise and windows can be opened to let in fresh air. The members’ lounge on floor 5 is based upon the idea of esteem. The floor features a mid-century library, an outdoor deck, several fireplaces and a central marble bar, all designed to create a residential ambience. “The design for this floor takes the notion of self-confidence set against innate human curiosity to drive everything from the layout – a series of spaces in varying sizes – to a curated but eclectic collection of 1940’s vintage mixed with modern furniture and furnishings,” explain the designers. The building’s penthouse was designed around the concept of self-actualisation. This space serves as a flexible event space, but while not in use, it doubles as a members-only quiet work floor as well as a gallery of rotating large-scale art installations. In addition, each floor features a private meeting space that can take the shape of a kitchen, board room or living room and can be used for private meetings, playing music, cookery classes and events. Furniture and light fixtures are a mix of bespoke and vintage pieces including a Carlo Scarpa chandelier that hangs in the entranceway. Twenty chefs work across the building’s five kitchens transporting food to each floor through service lifts and dedicated tea trolleys for the offices. The project marks the completion of AvroKO’s first ever co-working space. 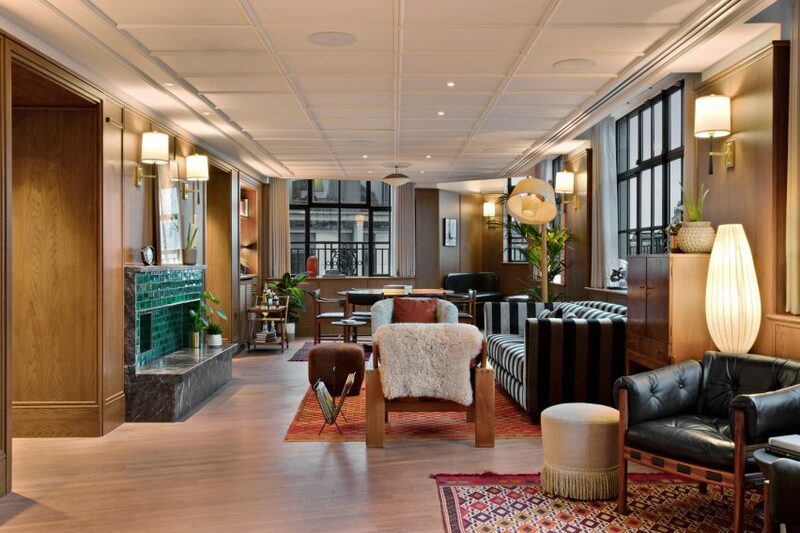 The US-based firm has previously worked on a “micro hotel” in New York City, as well as a mid-century motor lodge in California inspired by Wes Anderson. Photography is by Ed Reeve. @2015-18 - Arch360. All Right Reserved.